The Club: Meet Tom Langdon Hear the story of the AFL's newest Rising Star nominee Tom Langdon in the days following his debut against Fremantle in round one. Collingwood continues to secure its promising youth, with reliable defender Tom Langdon signing a three-year contract extension. The 20-year-old has been an important member of Collingwood’s back six, which is ranked in the league’s top two for points scored against. Collingwood defensive coach Ben Hart said Langdon plays with maturity well beyond his 24 AFL games. “Tom reads the game extremely well and can predict what is about to unfold, giving him the ability cut off opposition attacks which is highly valuable for us,” Hart explained. VIDEO: Tom Langdon tells his story on The Club. The club recruited Melbourne-born Langdon with pick 65 of the 2013 National Draft after he was overlooked the year prior. The composed defender played 19 AFL games in his first season, earning a Rising Star nomination and winning the 2014 Harry Collier Trophy as the club’s Best First Year Player. 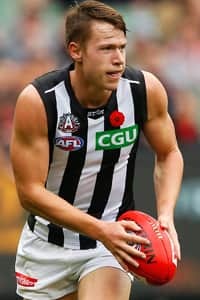 ANALYSIS: Is Tom Langdon the new James Clement? Langdon’s contract news comes just days after Jamie Elliott announced his re-signing, with both players committing to the club until at least the end of 2018. "I was lucky enough to get drafted here so I have got it so good," Langdon told the Herald Sun. "It’s a really good feeling when you see the interstate players re-sign and everyone wants to be part of the club. "You look at it and say, "Why the hell would anyone want to leave?"